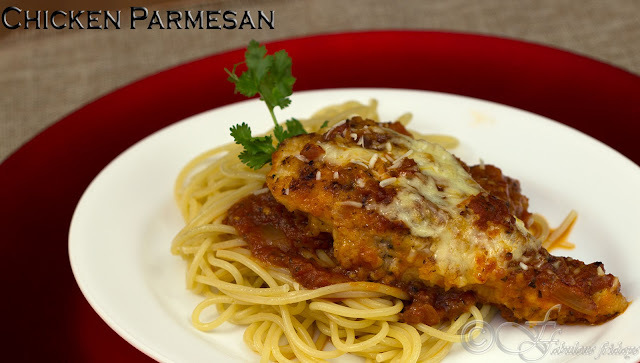 Breaded chicken breasts, moist and juicy on the inside and crisp on the outside, baked with thick luscious flavorful tomato sauce bubbling underneath, topped with mozzarella and parmigiano-reggiano. Created in America, this mouth watering dish has Italian roots and is a derivation of its cousin Melanzana alla Parmigiana, or Eggplant Parmesan. It is usually served over a bed of spaghetti with a side of greens. I sometimes serve it on a rustic toasted kaiser for a delectable sandwich. Preheat the oven to 400 F. Prepare a baking sheet by spraying it lightly with oil. Slice the chicken breast horizontally to get two thinner cutlets. Season these with salt and pepper. Dust with flour to coat evenly on both sides. Tap off any excess flour. In a large bowl combine panko, Parmigiano-Reggiano and thyme. In a separate bowl crack open the egg, add 2-3 tbsp milk and beat till yolk and white are combined. Dip the coated chicken cutlets in egg mixture and then dredge them in the panko mixture. Press down to ensure even coating. Heat 2 tbsp vegetable oil in a pan to a smoking high heat. Add the chicken breasts and sear both sides for a minute each till lightly golden. Do not over crowd the pan. Do this in batches. Place the seared chicken on the baking sheet, drizzle with some olive oil and bake in the oven for 15 minutes, till it reaches an internal temperature of 160 F. Remove from the oven. Pour half the tomato sauce evenly in a casserole dish. Place the cooked chicken breasts carefully on the sauce. Spoon the rest of the sauce on the chicken, sprinkle with mozzerella cheese and top with additional Parmigiano-Reggiano if you want. Bake again till the sauce is bubbly and cheese has melted and turned lightly golden brown. this may take another 15 minutes. Serve over a bed of spaghetti sprinkled with fresh parsley OR inside a toasted kaiser bun sprinkled with red pepper flakes. Punjab - the land of five rivers, the land of endless fields of lush greens tipped with golden yellow flowers, the land which nurtured sufi poets like Baba Farid, Bulhe Shah, and Waris Shah, the land that houses the undiscovered secrets of Indus Valley civilizations. Punjab - the home of tandoor and a remarkably robust cuisine that is richly influenced by its many invaders from Alexander (Greek) to Nadir Shah (Persian) to Sher Shah (Afghan) to Babar (Mughals). Punjabi cuisine reflects an abundance of fruits and vegetables, milk and butter, wheat and a multitude of spices. 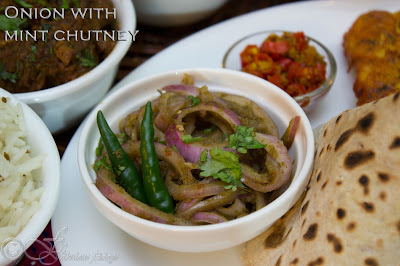 A simple thali will have a combination of vegetables and lentils served with ghee or butter spread over plain roti accompanied by raita and onions split open by smashing with a fist. 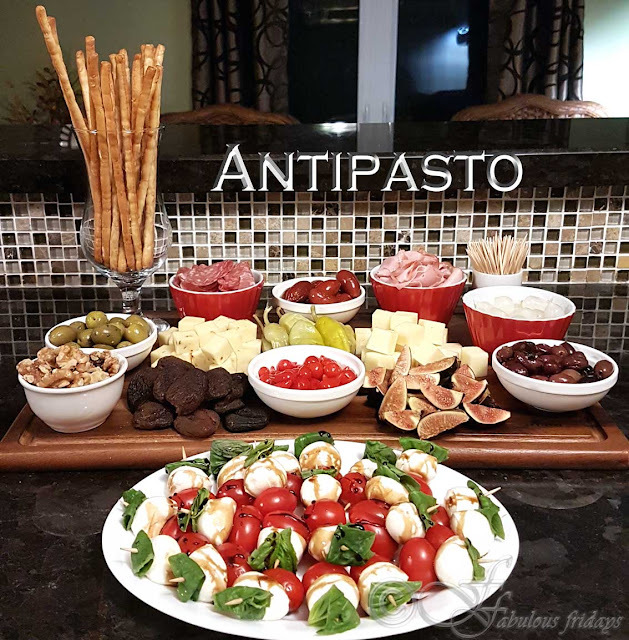 Traditionally meat dishes were prepared by men, specially on holidays or special occasions. This here is a collection of a variety of non - veg dishes that can be served together as a delightful meal complete with starter and dessert. 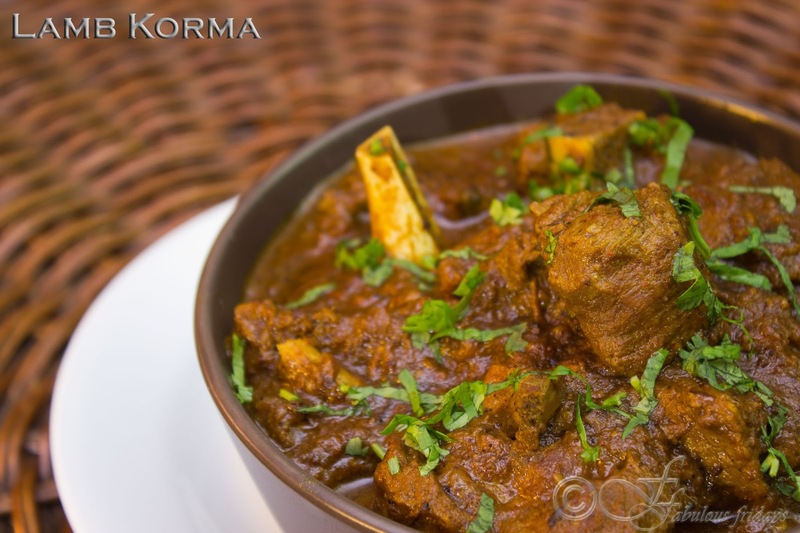 Korma is usually made by marinating the meat in yogurt flavored with garlic and other dry spices. This softens the meat and incorporates the flavor deep within. The marinated meat is then cooked with lots of onions, tomato and whole dry spices. Korma can be mild or hot depending on the desired heat level,achieved by addition of green chilies and/or red chili powder. Butter chicken or makhani murg is a rich creamy Chicken curry from northern India. 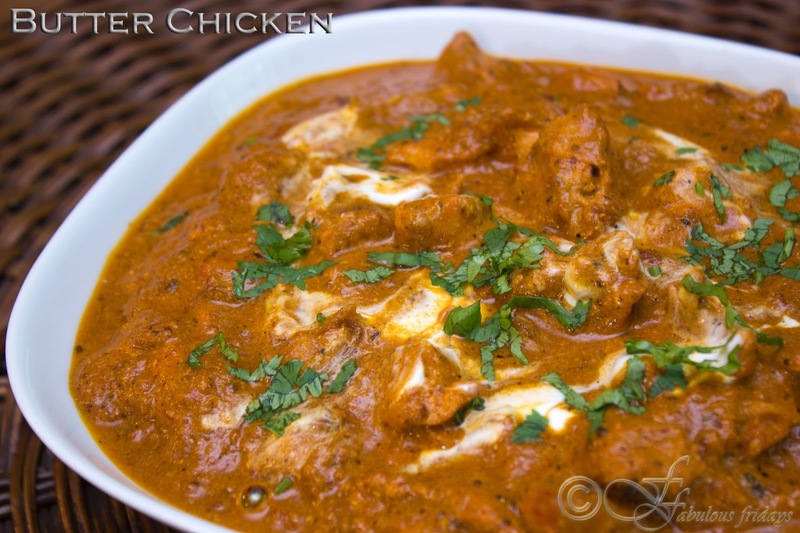 Among the best known Indian dishes all over the world butter chicken has its roots in the Punjabi cuisine. The rich rose colored gravy can be made hot or mild to suit every palate. 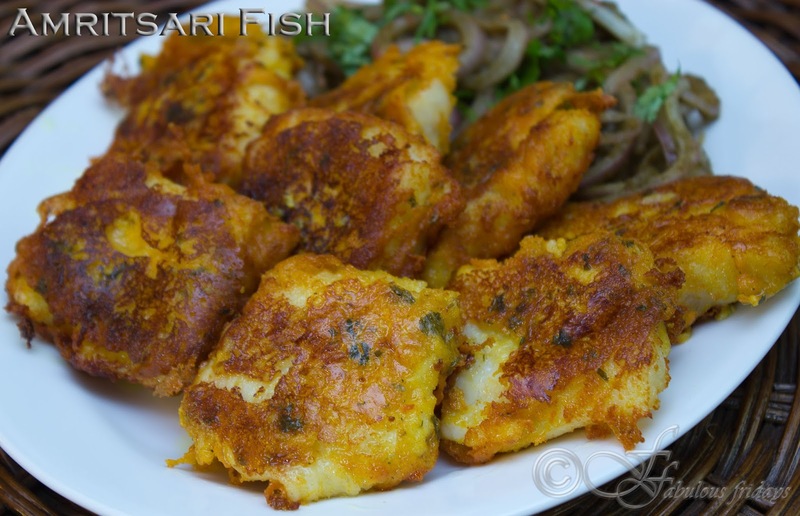 Named after its city of origin, fish Amritsari is a popular street food always served with a sprinkle of lime juice. 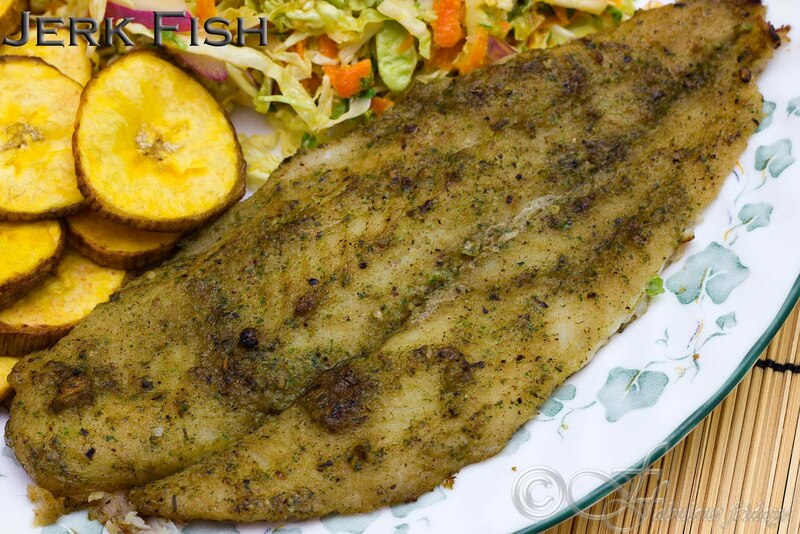 This dish calls for frying the fish but you can grill it as well. Use any firm fish for this recipe which does not fall apart while grilling. Cook small pieces as starters or a full fillet as the main dish. 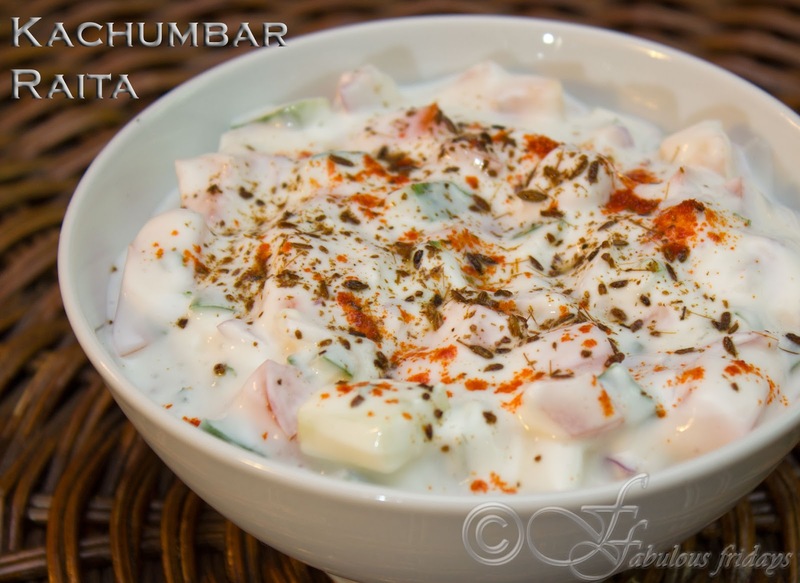 Mixed salad chopped to small bite sized chunks in creamy plain yogurt, flavored with salt and dry roasted crushed cumin. An excellent accompaniment to any spicy main dish as a cooling agent. Serve this with biryani, curried chicken and lamb, with any grilled meat and veggies, with stuffed paratha's and poori. This preparation is simple and complements all intense flavored curry dishes. Take one cup of basmati rice and two cups of water. Heat a 2 teaspoons of oil in a saucepan and add 1/2 teaspoon whole cumin seeds. 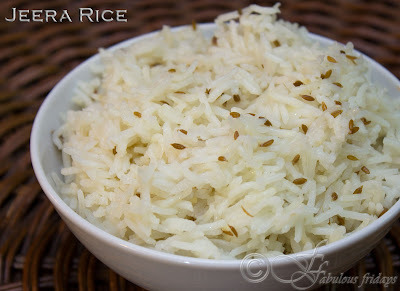 Sizzle for 10 seconds and add the rice and water. Season with salt if desired (I usually omit the salt) and bring to a rolling boil. Simmer and cook covered for 7-10 minutes till all water is absorbed and rice is fully cooked. emove from heat and fluff with fork. Serve hot. Sliced, thin onion rings with mint coriander chutney is an appetizing accompaniment to any grilled and BBQ meats. Adds texture and flavor with a burst of freshness from the fresh herbs in the chutney. For mint chutney recipe go here. Rings of hot Thai red chilies immersed in olive oil and a concoction of spices that are lightly toasted and coarsely pounded gives this beautiful pickle flavors that explode in the mouth like fireworks. For the recipe click here. 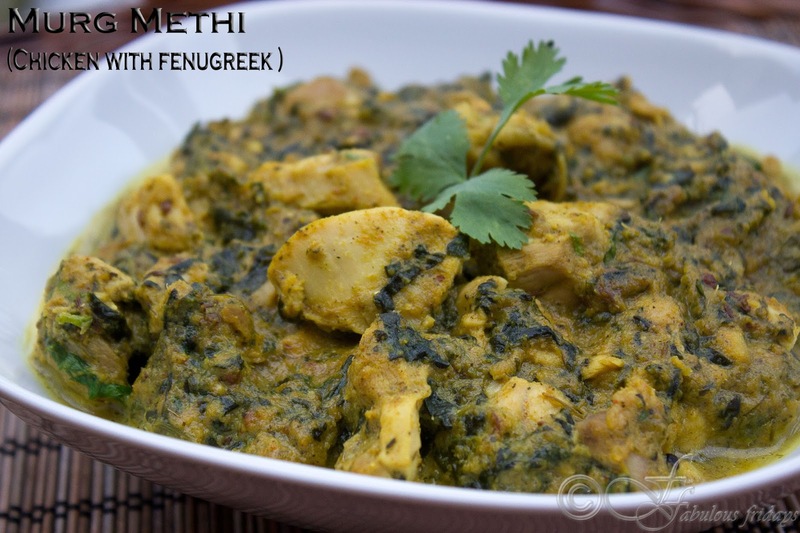 Tender pieces of chicken are cooked in a creamy earthy sauce, flavored with fresh methi (fenugreek) leaves to create this wonderful dish. The creamy consistency is obtained purely with plain yogurt and its tangy sourness balances beautifully with the slight bitterness of methi. In an attempt to make a healthy version, I have used very little oil for frying the masala (details in the recipe below). 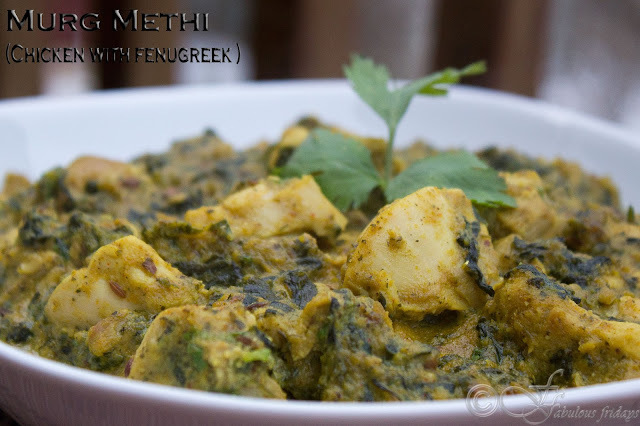 Methi is available in many forms - fresh, dried herb, seeds, etc. This delicious green leafy vegetable is a rich reservoir of medicinal properties. Read more about its health benefits here. 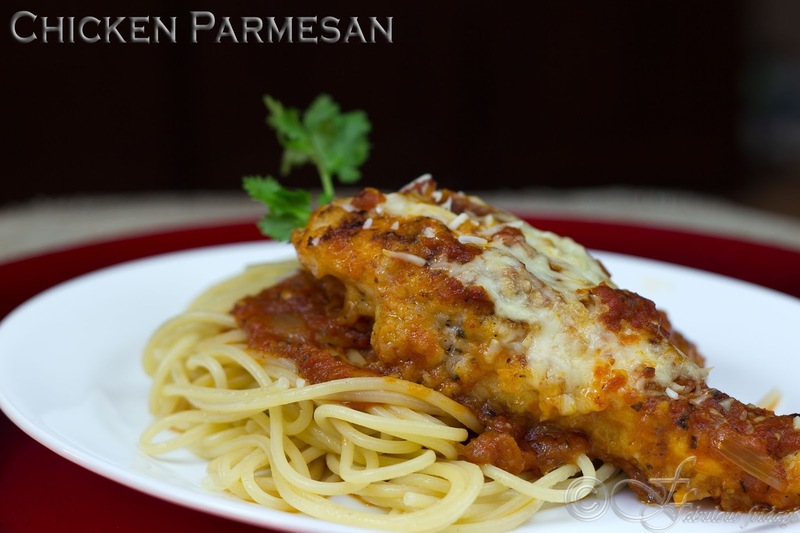 You can use either boneless or bone-in chicken for this recipe. Marinate the chicken in the ingredients listed under marinade, for a minimum of 4 hours. Heat 2 tbsp oil in a pan on medium heat. Add cumin, cinnamon, cloves and cardamom. Let these roast in oil for 15 seconds till cumin turns golden. Add the ground onion paste. Cook stirring constantly till paste turns light brown. If the concoction starts to burn you have two options - one, add more oil and reduce heat a bit and continue cooking; two, sprinkle a little water and reduce heat a bit and continue cooking. The water method works really well and since we don't want the onion to brown too much, I opted for this reduced fat option. After the onion paste is roasted, add fresh methi and cook till all the leaves wilt. Add the marinated chicken along with the yogurt and mix well. Add coriander powder and water and bring to boil. Simmer and cook covered for 10-15 minutes till chicken is cooked through. Check for salt and consistency. If its too dry then add a bit of water, if too runny then boil off some. 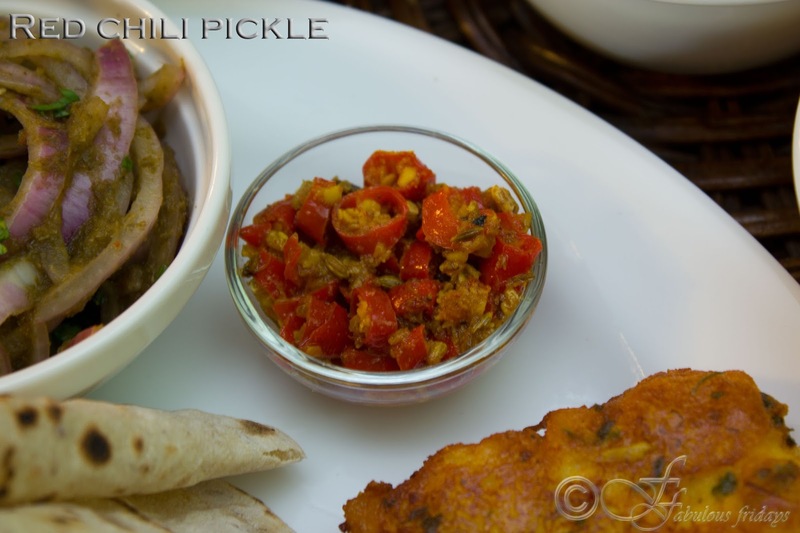 Sprinkle with fresh chopped coriander and serve hot with tava roti and salad. Jerk style of cooking means Jamaican BBQ. Traditionally chicken and pork are cooked with the jerk seasoning which gets its distinctive taste from allspice and scotch bonnet peppers. Jerk seasoning could be made as a dry rub or a wet marinade and uses several spices as listed below. Traditionally Jerk meat was cooked in smoked pit fires imparting a distinctive smokey taste. Over time this technique evolved and oil barrels were used as smokers to save time. You can use jerk seasoning to marinate any kind of meat. The longer the meat sits in the marinade the better it tastes. But fish is a delicate meat, so marinate only for 15-20 minutes. Take all the ingredients for marinade in a food processor and blend to form a smooth paste. Add a splash of rum (optional) and mix well. Marinate the fish fillets for a minimum of 15 min. Grill on medium high, turning once till cooked through and crisp. I baked these in the oven at 450 F for 10 minutes, without turning. After 10 minutes got rid of the water that collected in the tray. Cooked for another 5 minutes till sizzling. 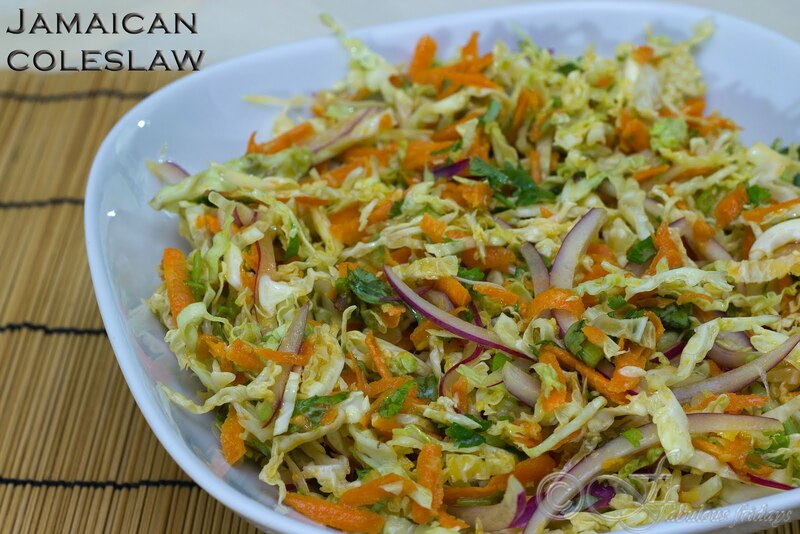 The vinaigrette dressing for this slaw is tangy and sweet. No mayonnaise is used so the slaw remains crisp. The longer the salad sits with the dressing, the better it gets. In large bowl, whisk together the first five ingredients. 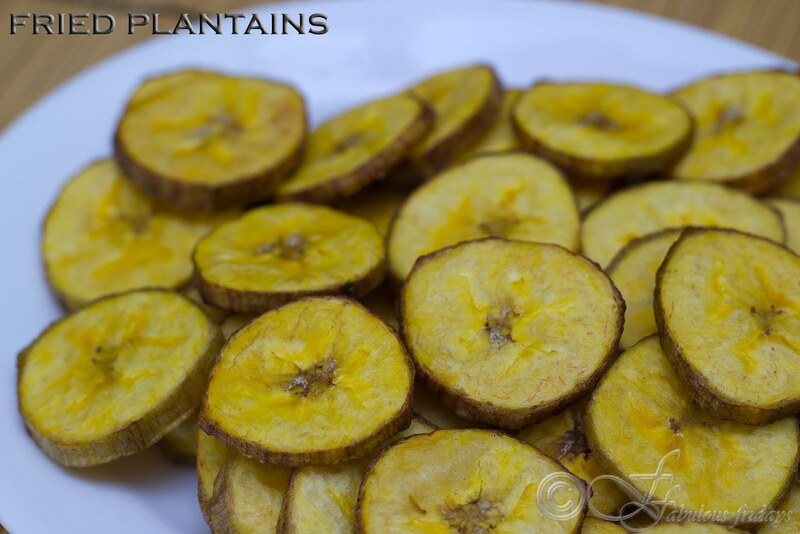 Green plantains are starchy and taste like potatoes, but as they ripen they become yellow and soft and sweet. Fried sweet plantains are commonly served as a side to savoury dishes such as fish. Trick to making delish fried plantains is to know how to choose them. If you want sweet crisp dish then choose the riper bananas - the more beaten up and black the skin looks, the riper and sweeter they are. Heat oil in a pan to medium high heat (about 340 F). Peel plantains and slice crosswise into 1/4 inch slices. 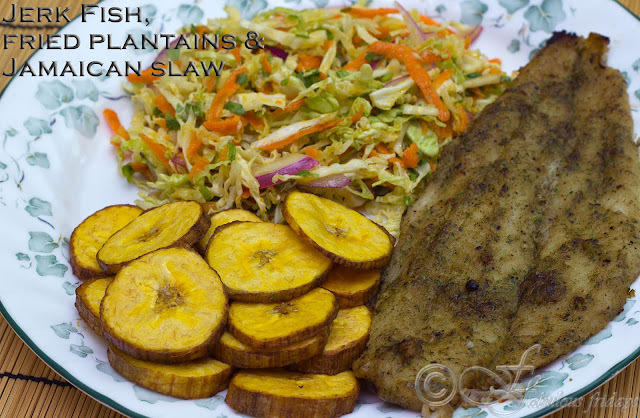 Carefully add plantains to oil and fry until golden yellow in color, about 2-3 minutes per side. Be careful to not burn these. The riper the plantains are the easier they are to burn. Just make sure to watch them and turn them as needed. With a slotted spoon, remove the plantains from the pan into a dish lined with paper towels, and sprinkle with salt, if desired. Serve immediately. Fools are the simplest of desserts. They are just ripe pureed fruit folded in whipped cream and then layered with cut fruit and or chopped nuts. Here is one delicious and delightfully simple recipe - Mango fool. In season you must choose the ripest mangoes for making this. Another option is to use canned mango puree. Just be aware that the canned products are very sweet so adjust your sugar accordingly. Take equal quantities of mango puree and double cream for a creamy outcome. To make it less calorie dense use half the quantity of cream and substitute other half with Greek yogurt. Tastes just as good. Peel and chop 2 mangoes to small bite sized pieces and keep aside. Slice the berries and keep aside. Peel 4 mangoes and slice the flesh away from the stone. Process in a food processor till smooth with no lumps. This should make about 2 cups of mango puree. If the mangoes are too sweet then add juice of 1/2 a lime here. Take equal quantity of double cream (2 cups) in a mixing bowl placed over ice. Add sugar and beat gently till it thickens. 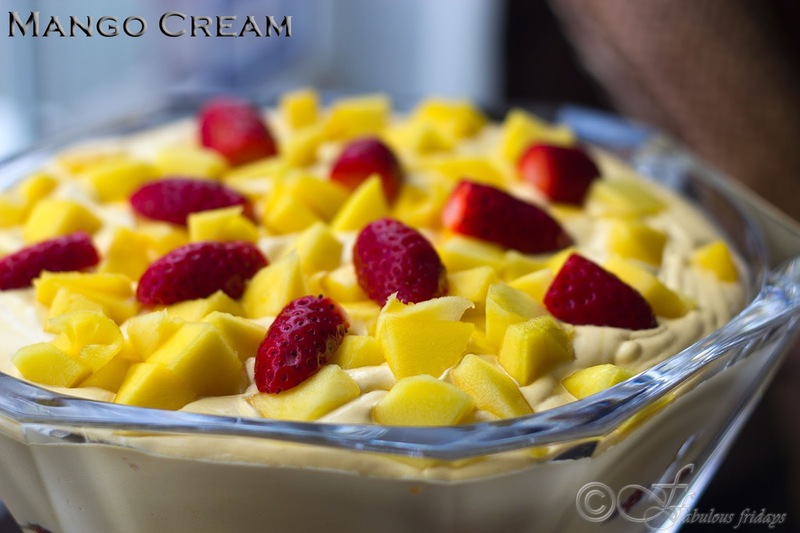 Fold in the mango puree into the whipped cream until well combined. Cover and refrigerate for half hour to let the flavors blend in. Two ways to serve - see below. Layer chopped fruit and mango cream in a large serving bowl, top with fruit and keep cold till ready to serve. 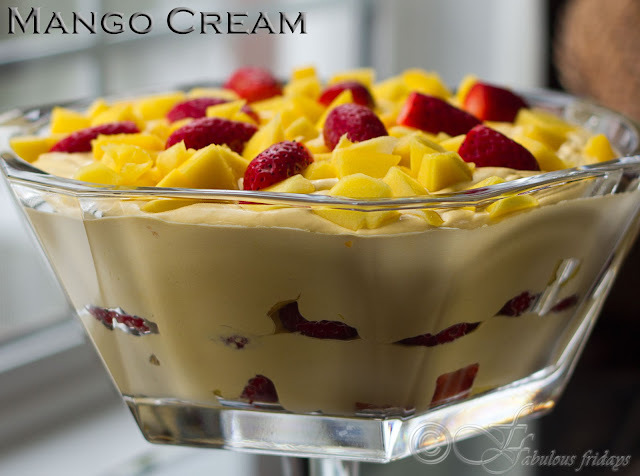 Layer the fruit and mango cream as individual serving in small glasses, top with fruit. Serve cold.